A founding father of Southern, Parkinson belonged to its original eight-member faculty. 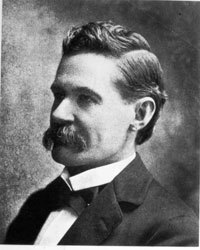 During his career, he taught physical science here, became secretary of the faculty, registrar and vice president before being promoted to Southern’s highest post in 1897. The University embarked on a building boom under Parkinson’s guidance. Among the notable additions: the $25,000 Wheeler Library (a graceful building now known as Wheeler Hall in central campus) opened in 1904 to house the growing book collection. The building bears the name of then-University board president and Judge S.P. Wheeler of Springfield, who’d help secure capital funding. The Allyn Building opened in 1909 to house the University’s Model School, an elementary school where aspiring teachers honed their instructional and classroom management skills. And construction of the first on-campus residence hall began during his tenure. Today, students study geology and other sciences in Parkinson Hall, a building in central campus named after this late leader.